Robert Taylor's final painting in his 60th Anniversary trilogy features a scene from the attacks on the afternoon of September 7, 1940. Led by Herbert Ihlefeld, Me109E's of II/JG2 dive through the bomber formation giving chase to Hurricanes of 242 Squadron as Ju88s of KG30, having unloaded their bombs, head for home. One Ju88 has been hit and is already losing height, and will not return. Following behind He111s of KG53 try to keep formation as they fly through flak. The sky is alive with action. A majestic painting by the world's foremost aviation artist, depicting a moment from the defining day in the most significant air battle ever fought. Long since sold out this is now a highly sought after edition. 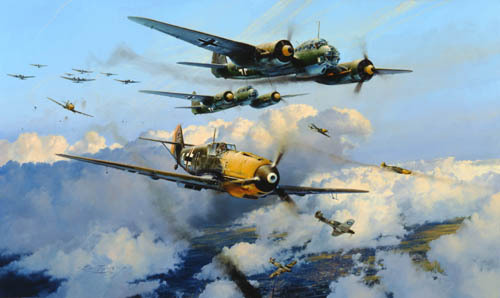 Each print is signed by the artist along with five distinguished Luftwaffe pilots who fought in the Battle of Britain.